Diabetes affects every age, but this is a site especially made for those of us with teen diabetes!! I am a young adult with teen diabetes also known as Type 1 Juvenile Diabetes. I like to call it teen diabetes because it sounds like it's more about us! And it is about us! Although others young and old also have type 1 diabetes, us teens are the ones that have more problems. This is because of all the changes that we are going through in our teen years. We have to show those younger than us that having diabetes isn't all that awful! A lot of you teens out there are sharing the same problem. Some of you have friends who might have just been diagnosed with type 1 juvenile diabetes, also known as Juvenile diabetes or teen diabetes. To be perfectly honest, I didn’t even know what diabetes was when I was diagnosed. I thought that it was something only old people got. As I learned more about it I realized that there are two kinds of diabetes; Type 2 diabetes and Type 1 juvenile diabetes. Type 1 diabetes is what us teens have. When I heard from the doctor that I had type 1 diabetes, I chuckled because I thought there was no possible way that I could have acquired this disease. I thought it was something only older people were diagnosed with. Many of you may be able to relate with this. Some of you may have just been diagnosed with type one diabetes and some of you may have had it for a few years now. No matter what the circumstance I hope that this website will help you to better understand how to live well with type one diabetes, and how to cope with it as a teenager. The only way I can answer is to tell you how I dealt with it. I am still dealing with these kinds of problems, but through every new experience I learn more! I have been very blessed to have the opportunity to pass this on to you. You may think that diabetes is a little scary and overwhelming at times, but don’t panic. There are others out in the world who share the same “scary” disease. 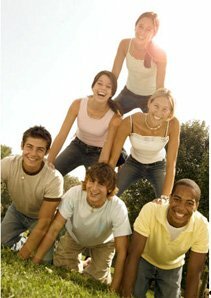 Many other teens that will help you make life livable with type one diabetes. So when someone asks you 'how do you feel about having teen diabetes' you can tell them, "bring it on!"